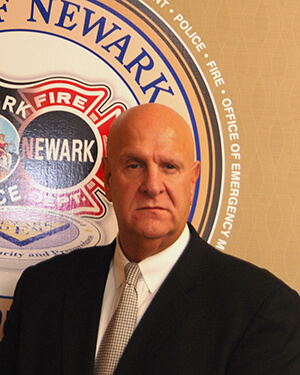 Public Safety Director Ambrose was born and raised in Newark. He received both his Bachelor of Arts and Master of Arts degrees from Farleigh Dickinson University. He is also a graduate of the FBI National Academy. In 1986, Director Ambrose joined the Newark Police Department as a police officer and rose through the ranks. He was promoted to the department’s Chief of Police in 1999. In 2006, he was appointed as the Police Director, overseeing more than 1400 sworn officers and managing an annual budget of $123 million. Director Ambrose joined the Essex County Sheriff’s Office in 2006 and served as Undersheriff before being hired in 2008 as Chief of Detectives for the Essex County Prosecutor’s Office.